Tom Augspurger of the US Fish and Wildlife Service taking core sample after the Dan River coal ash spill. (l-r) Augspergerm John Fridell, USFWS, and Rick Smith, Duke Energy. Photo by Steve Alexander, USFWS. 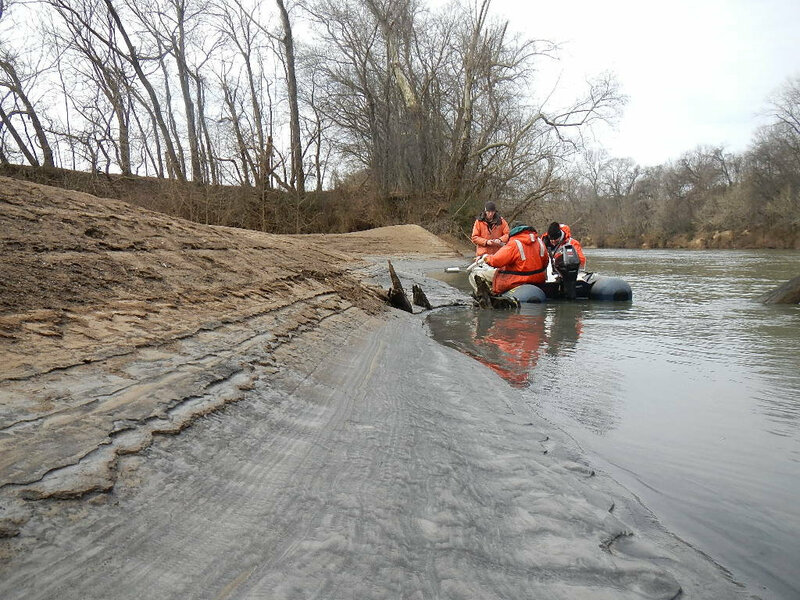 Parts of the Dan River and Belews Creek, which feeds it, were on the impaired waters list before the spill and remain on the list..
Until that winter’s day, the 4-foot section of corrugated metal pipe, 48 inches in diameter, had done its job. It swallowed storm water, said to be uncontaminated, that drained from Duke Energy property, chugged the water through its gullet that ran beneath an unlined coal ash basin, and then spewed it into the Dan River near Eden. But on Feb. 2, 2014, the pipe could take no more. For more than 50 years, Duke Energy had dumped millions of tons of coal ash into an open, unlined pit at its power plant on the Dan River. On that calm, cloudy Sunday afternoon, as pre-gamers chilled beers and fried chicken wings for their Super Bowl parties, the pipe collapsed. Hazardous material from the basin rushed through the breach, which released at least 39,000 tons of ash and up to 27 million gallons of contaminated water into the Dan River. At 2 o’clock, a security guard making the rounds had noticed the water level in the 27-acre ash pond had dropped. At 6:30 p.m., thousands of North Carolinians watched the Seattle Seahawks, led by former NC State quarterback Russell Wilson, win the coin toss to start Super Bowl 48 against the Denver Broncos. Two minutes later, as the Seahawks kicked off, Duke Energy officials were investigating the pipe breach and preparing an EM43 report, used to document emergencies in North Carolina. Like the gamblers who bet on the Broncos to win the Super Bowl, the utility’s statement missed the mark. In fact, the Dan River is a drinking water source for Danville, Va. At least 2,500 tons of coal ash rested in the Dan River near the Schoolfield Dam and the city’s water intake system; the pollution flowed at least 70 miles downstream. It would take months, not days to initially clean up and repair the damage – and years to remedy the harm from our reliance on coal. Compared with the Tennessee Valley Authority’s coal ash catastrophe in Kingston, in 2008 the Dan River incident was first characterized as a spill. But the passage of time often changes perspective and illuminates truth. Now the breach is more accurately described as a disaster. Environmental advocates like Appalachian Voices, Waterkeeper Alliance and the Southern Environmental Law Center had long warned the state and the utility that the integrity of the coal ash basins was suspect. Neither heeded those admonitions, and on Feb. 2, 2014, the advocates’ predictions came true. The Dan River disaster and the events of the past five years have eroded people’s faith in their government and broken trust in the purity of their drinking water. It stymied Republican Gov. Pat McCrory’s re-election. A former Duke Energy employee, McCrory led an administration that thwarted citizens’ attempts to sue the utility, mishandled drinking water advisories and falsely accused a state scientist of perjury. Over the past five years, Duke has excavated 22 million tons of coal ash from its basins in North Carolina, although some of that work was done under threat of private lawsuits filed by the Southern Environmental Law Center. In the coming months, excavation will be completed at seven additional basins at the Dan River facility and at the Riverbend Steam Station in Mount Holly. The utility has also dewatered several of its basins and is recycling coal ash at some sites. But this progress has occurred against the backdrop of Duke Energy’s proposed cleanup plans – including a publicly despised cap in place for six sites – as well as fines, rate hikes, ongoing litigation, conflicts over permanent drinking water supplies, groundwater contamination beneath the plants, and unpermitted seeps from the basins which violate the Clean Water Act. Yet the events of five years ago also galvanized citizen watchdogs to further monitor the actions of both the utility and state regulators. Policy Watch asked four people to reflect on how the Dan River disaster affected them and their relationship to water: Waterkeeper Pete Harrison, artist Caroline Armijo and farmer Buck Purgason. They either live in the Stokes/Rockingham County area or were among the first environmental advocates on the Dan River after the disaster. The interviews have been edited for space and clarity. 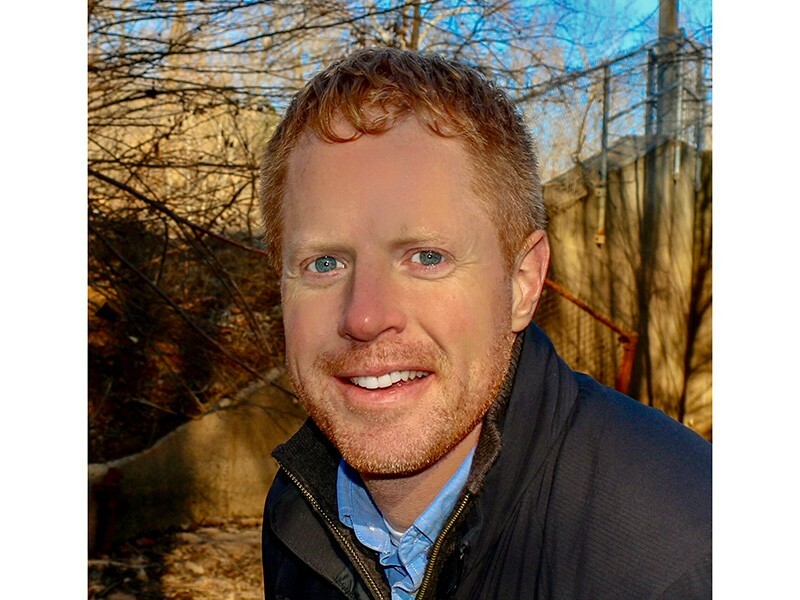 Pete Harrison is a staff attorney at Earthjustice in Philadelphia. He lived for several years in Asheville and previously worked for Waterkeeper Alliance on coal-related pollution issues. “We had been attempting to address the coal ash dumps at Duke Energy for a year. We’d announce an intention to sue, which required us to wait 60 days, but then then DENR [now DEQ] would swoop in and settle for pennies on the dollar. In November 2013, environmental groups were allowed to intervene in a lawsuit but the state did nothing to prosecute the case. Six months later they get caught holding the bag with the Dan River spill. It’s vivid proof of why it matters. The day after the spill, [fellow Waterkeeper] Donna Lisenby put kayaks in the water. I remember we had someone flying over the site to see the river. It was brown and muddy, but there was a plume of what looked like gray paint hugging the bank where the pipe was. It fanned out and the whole river was just gray. There were thick layers of ash on the banks and sitting on the bottom. I remember seeing raccoon footprints in the ash. The ash started at the plant and went all the way to Draper Landing – 2.4 miles — and beyond. The state collected the first water samples. As the week played out, no data was available but they said, “You have nothing to worry about.” We got out there and sampled, and it showed there were high levels of arsenic. The state’s results showed some of the same chemicals but in lower amounts. Where did they go to sample? That’s an important role of waterkeepers because you can’t trust information coming from the government. 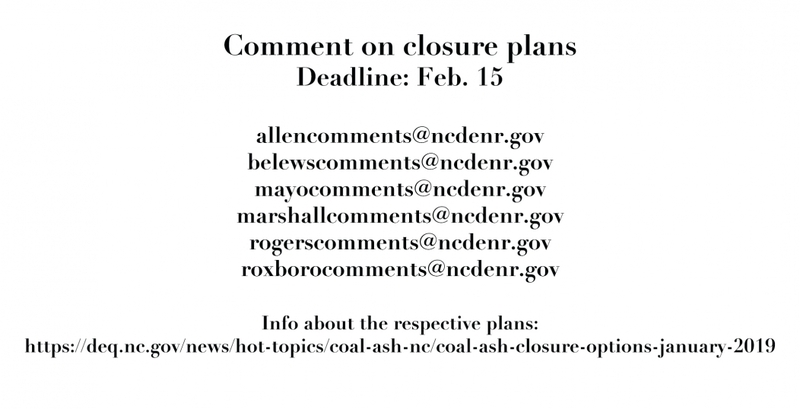 The spill shined a light on the inherent problem with coal ash. These incidents raise awareness. There’s so much of it and it’s been neglected for so long. It’s toxic and stored in a very uncontained way. We haven’t learned how to compel a solution for these sites, so we have a half measure – cap in place — of getting standing water off the basins. Caroline Armijo grew up in Walnut Cove, where the Belews Creek plant is located, in Stokes County. 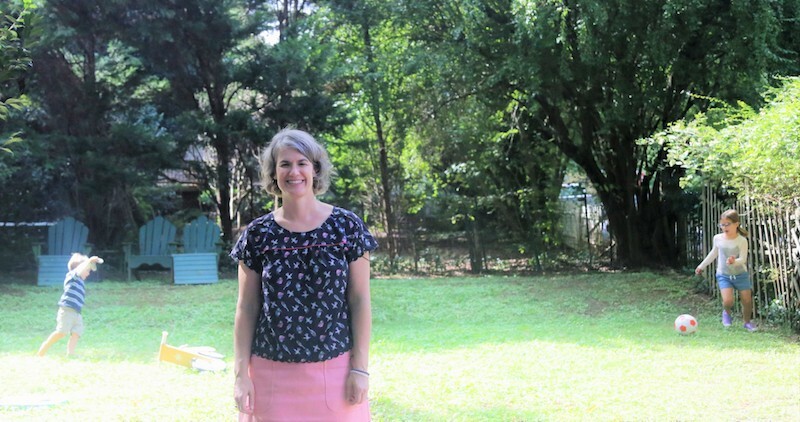 An artist, she received a grant last year from the National Creative Placemaking Fund to use coal ash in art installations in public spaces in Walnut Cove. She lives in Greensboro. “I learned about coal ash in 2010, when I was living in Washington, D.C. We were fighting the EPA to classify coal ash as hazardous. [The EPA, under political and industry pressure, classified it as non-hazardous.] I would go to Interfaith Power and Light protests at the EPA, and it helped me understand government. At the DEQ hearings, I try to argue my case from a legal and solutions-based approach. The government doesn’t care about emotional responses, although now I am shifting to a more human story approach. I’m very concerned that they want to cap the ash in place at Belews Creek. I hope DEQ will rise to the occasion. Many people were upset about how the meeting in Walnut Cove went – the table format. People were upset and said they felt they weren’t treated well by state employees at the tables. They were also getting wrong information. One man said he was just being shunted from table to table. 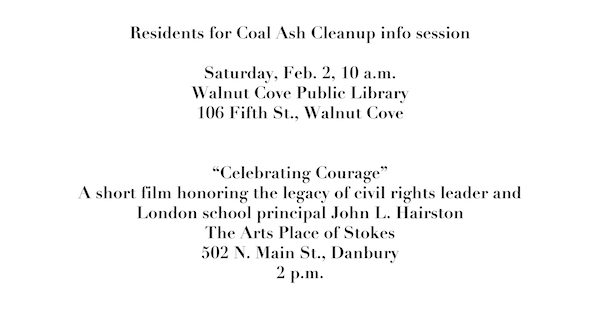 So we’re having a DEQ hearing redo – without DEQ – on Saturday at 10 am, with the SELC and Appalachian Voices. Buck Purgason is a Rockingham County produce farmer, fisher and carpenter. A member of the Good Stewards of Rockingham County, Purgason lives a mile from the Dan River, upstream from the Duke Energy plant where the disaster occurred. “Twenty years ago I was a fishing guide on the Dan River. There was striped bass in Kerr Lake and those fish would run up to Danville and spawn in the springtime. Fishers started catching them before they spawned, but the fish were on the verge of coming back – and then after the coal ash spill, it got worse. Good Stewards of Rockingham has shifted our focus to protecting the Dan River. But we couldn’t get anywhere [in gathering support] because Duke Energy has thrown money at the county and different organizations as grants and at Eden to upgrade the water treatment plant. Who’s monitoring how much runoff is going into the Dan River? DEQ doesn’t have manpower to monitor it. That water from Belews Lake [site of the Duke Energy’s Belews Creek plant] runs into the Dan River. When the lake was first built, it was great. Now there are signs that say Don’t Eat the Fish. That tells you something’s wrong. At Belews Creek Duke has a 200-acre coal ash pit. Just like at the Dan River, they put the coal ash basin in a creek bed, but the creek bed is no longer dry. Duke Energy did not clean up all that was spilled, plus they continue to allow coal ash to flow into the river unchecked [through unengineered seeps]. The Dan River is nowhere like it used to be. I fished down there from early ’80s and I still go every year. I used to catch white bass, and now I can’t catch one, period. I used to catch 20-pounder striped bass. Now if you catch a 5-pounder, you’re doing good. Some of that is overfishing, but there’s too much water being taken out of the Dan River [for industry and utilities].